In the summer of 1966 I had to make-up an English class I had failed. So off to summer school I went. For a second class I took metal shop. The shop teacher brought in a mini bike that he had made and asked if anyone wanted to make one as a project (there were no plans we just copied his). I went home and asked my parents if I could make one; my folks reluctantly said yes (I don’t think they figured I could complete it). The rest is history! Motorcycles, (with the exception of many other things) have been much of my life’s work. I started working at a Yamaha Triumph Dealership (International M/C) just out of high school in 1972. We worked on everything. No one there liked to work on Triumphs, as a result I got a lot of experience in the ten years I worked there. I’ve owned hundreds of motorcycles over the years, and having been broken many times as a result of riding and racing them, I certainly have no regrets! 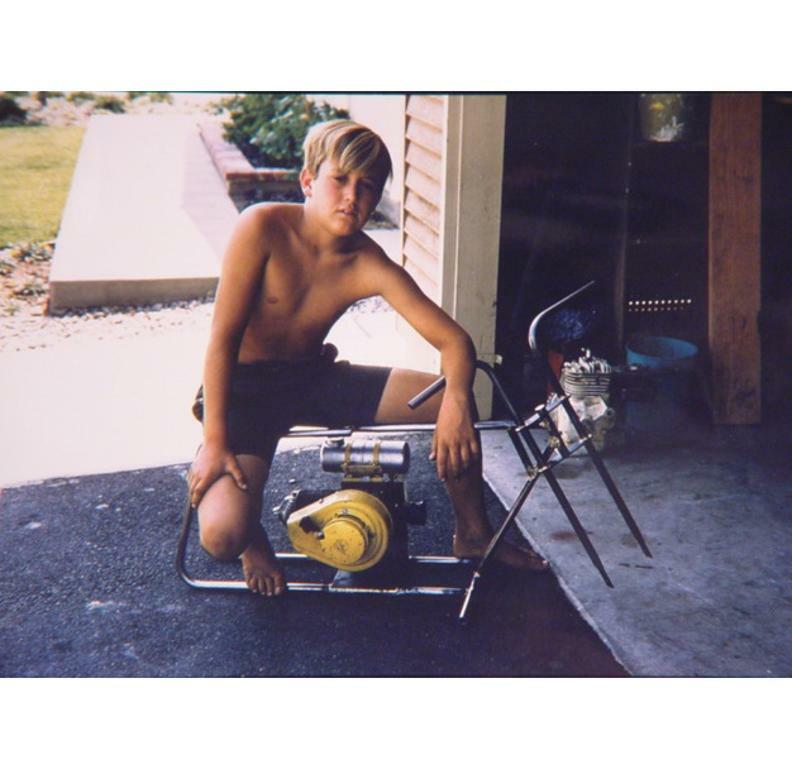 From the time I was a young boy, motorized things caught my attention. I can remember my cousin giving me a ride on his go-kart and my mother freaking out that I might fall off. Standing at the curb of our Reseda California home I recall watching a motorcycle ride by, thinking how cool it would be to even get a ride on one let alone pilot one, as would later prove to be so. IN 2003 A CHUCK LUNDQUIST GAVE ME THE EXACT WEST BEND 510 ENGINE IN BRAND NEW CONDITION THAT I HAD USED IN MY ORIGINAL MINI-BIKE THROUGH A DEAL WE HAD DONE ON 1970 BONNEVILLE. IT TOOK ME UNTIL 2013 BUT IN FALL OF THAT YEAR I REPLICATED MY ORIGINAL MINI-BIKE FROM SCALING THE PHOTO WITH A PAIR OF CALIPERS AND MEMORY. HERE IS THE FINISHED PRODUCT WHICH NOW HAS A WEST BEND 3 PORT 700 IN IT. 10TH GRADE OF HIGHSCHOOL 1970 ON MY BUDDY VINCE'S 1967 BULTACO MATADOR -- GEE DID I THINK I WAS FAST. I LATER WOULD BUY MY OWN 1964 BULTACO SHERPA 200. 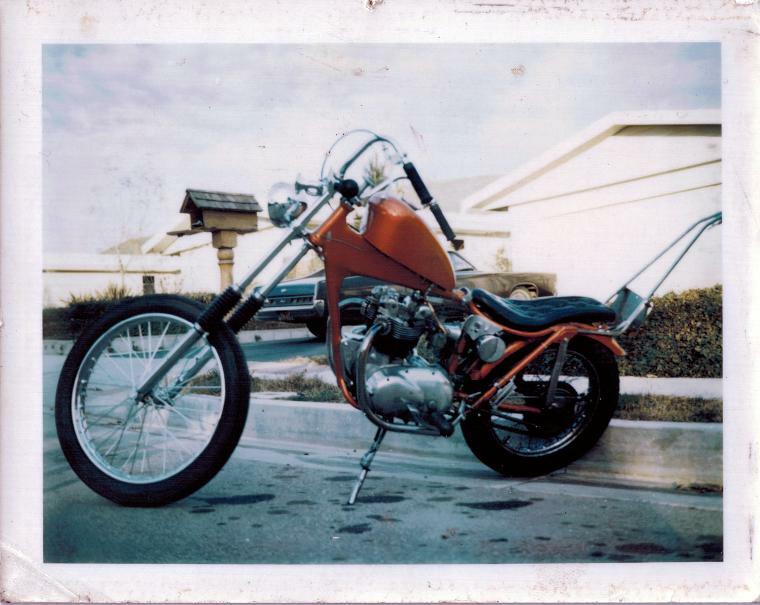 BY THE TIME I WAS A SENIOR IN HIGHSCHOOL IN 1972 I BROUGHT THIS BIKE (MY FIRST 1966 BONNEVILLE)BACK FROM A DIRT BIKE AND TURNED IT INTO WHAT YOU SEE- APPARANTLY I HADN'T FALLEN OFF ENOUGH. I CONTINUED TO DO CRAZY THINGS LIKE THIS AS WELL AS WHEELIE MY 1970 HONDA 750 THROUGH 3 GEARS. WHEN IT WOULD LAND THE FRONT WHEEL HAD STOPPED AND IT WOULD SMOKE THE FRONT TIRE UPON LANDING- I WISH I HAD TAKEN PHOTOS OF THAT AND MANY MORE OF VARIOUS STUNTS OF MINE.